The Tripp Lite N201-025-BL Cat6 Snagless Molded Patch Cable combines efficiency with performance. This 25-foot network cable delivers video, voice and data signals with speeds up to 550MHz. The Tripp Lite N201-025-BL Cat6 Snagless Molded Patch Cable is specifically designed for Category 6, Category 5e and Category 5 applications, ensuring stable performance every time. It also eliminates interference as it comes in a copper wire construction and a staggered-pin plug design. It is UL verified and EIA/TIA Cat6 TIA/EIA-568-B-2.1 draft 9 compliant. The snagless boot feature prevents cable snags for a clean install. What are you waiting for? 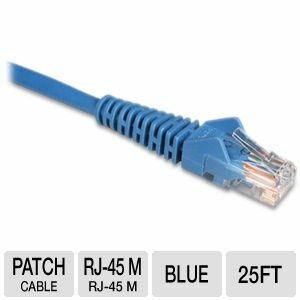 Grab the Tripp Lite N201-025-BL Cat6 Snagless Molded Patch Cable now.